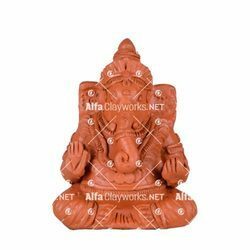 Our product range includes a wide range of terracotta ganesha statue and terracotta dhoop stand / burner. Features Brings Good Luck, Prosperity, and Wisdom. Natural Clay made Ganesha is the symbol of guileless soul and has immense power to erase all our obstacles. Lord Ganesha brings good luck, prosperity and wisdom in the lives of people. This auspicious idol with detailed design and perfect finish will not only for pooja room, but will also look graceful on the shelf of your living room. Just Gift a Ganesha and Let your dear ones know you really care for their wellbeing. It will look gorgeous wherever it is kept, and enhances the overall decor of the house. Specialty Easy to Hold and Move While Burning. 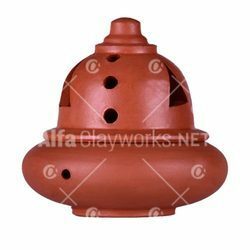 Extraordinary incense burner completely handmade from natural red clay. Burning incense in clay burners purifies the atmosphere by removing air borne impurities. Regular usage promotes good health and well-being, enhancing the mood and creating a pleasant atmosphere. Burning incense helps mind to relax and leaves a sense of focus. Protective lid prevents fire accidents and can safely dispose ash without making a mess. Looking for Spiritual Decor ?